In case you aren't familiar with the concept of “overlanding,” it's basically traveling through an area over land, usually in a large purpose-built vehicle. In Africa, overlanding is one of the best ways to truly experience the continent's incredible cultures and wildlife, since it means you're on the ground actually seeing everything. Before my trip, I spent hours Googling packing lists for safaris and overland trips, wanting to be sure that I was leaving home as prepared as possible. And, in order to help contribute my own tips, I've decided to share my full packing list with you along with what I learned about what you really need. I traveled through Southern Africa in May 2016 – the beginning of winter. The essentials will change slightly based on which countries you're traveling through and what time of year you're going, but here are all the absolute must-haves. Everyone is given a locker on your overland truck, and this is where all of your possessions will live for the duration of your trip. Locker sizes depend on the company you book with and the truck you're traveling on, but generally they are between 60 and 70 liters, not very tall but quite deep. This means that a traditional suitcase probably won't fit. It's recommended that you bring a backpack or other soft-sided bag like a duffel instead. I traveled with my , which is essentially a backpack with wheels. It fit fine into the locker on Acacia's Kavango truck, though it was a squeeze to fit both this bag AND my camera backpack into the same locker. If you can pack lighter, I would go with something like the or . Overlanding in Africa usually means camping every night. On my trip with Acacia Africa, we usually pitched our tents in established campsites, but some other companies participate in bush camping (i.e. just pulling over and setting up camp anywhere). The overland company you book with should provide two-person tents, but you'll need to bring your own sleeping bag. I purchased a Helio Sack from REI that was rated down to 55 degrees F, and also a , which is adds 15-20 degrees of warmth to a sleeping bag. I thought this combo would be fine for winter in southern Africa, but either my internal nighttime temperature just runs really cold, or I totally misjudged how cold it can get in the desert at night! I spent the first two nights shivering in my tent. I ended up purchasing an extra blanket at a convenience store, which gave me enough added warmth to be cozy every night. 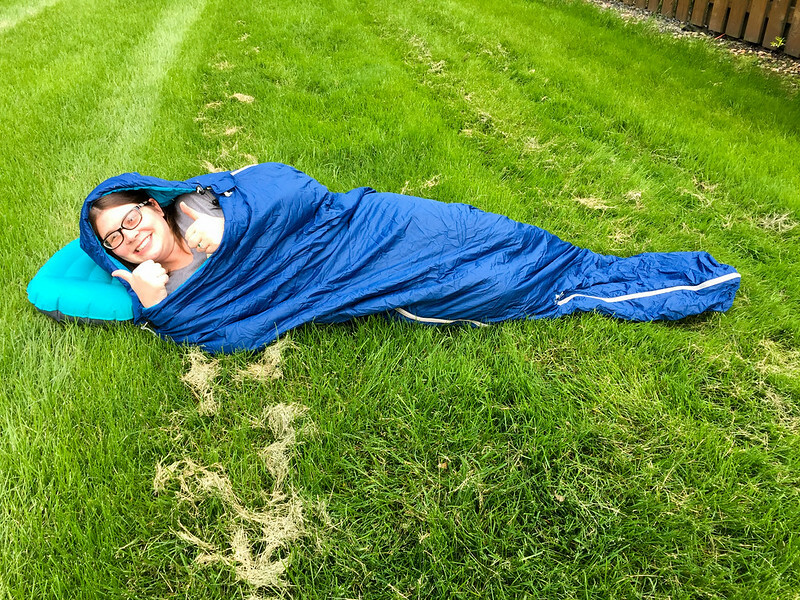 Me with my sleeping bag and inflatable pillow. My sleeping bag + liner combo would have been fine in another season, and would have also been perfect for Eastern/Northern Africa. But if you're going to be overlanding during the winter months in Southern Africa, definitely buy a slightly warmer sleeping bag (I would probably get one rated down to freezing!). *Also check whether you need to bring your own sleeping mat. Acacia Africa provides mats for all passengers, but other companies will require you to bring your own if you want one. Just as you'll need to bring your own sleeping bag, you'll also need a pillow. Many people ended up purchasing full-sized pillows once they got to Africa, but I actually found my small, to be just fine (AND it took up less room in my locker!). Speaking of temperatures, you definitely want to bring clothing that you can layer. It will get chilly at night, but can be hot during the day. You can find my full list of clothing I packed further down in this post, but I definitely recommend thermal layers for sleeping (this and are my favorites), a for evenings and early mornings, and then everything from hoodies to tank tops for layering during the day. I also brought my trusty with me. 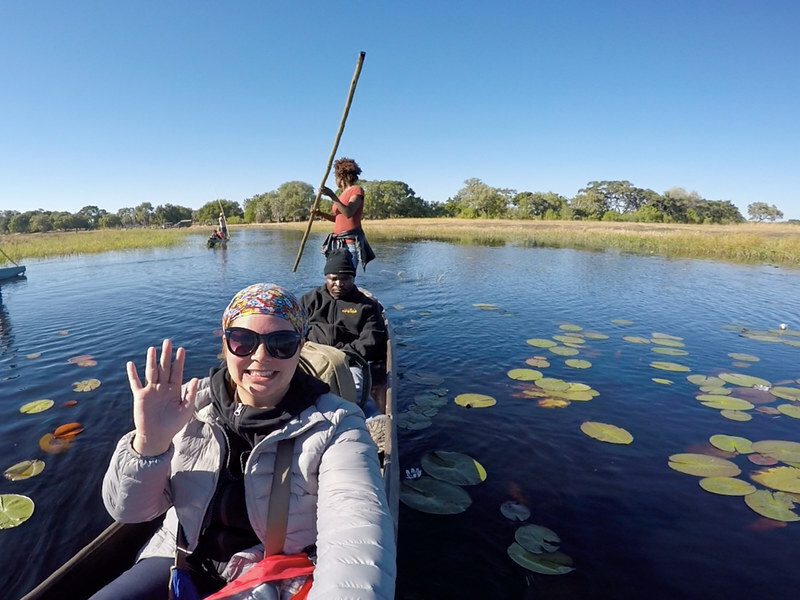 Me wearing lots of layers in the Okavango Delta. In Southern Africa, you'll likely stay in campsites with really good facilities – hot showers, flush toilets, even bars and swimming pools! But since you usually only spend one night in each place, having a is essential; otherwise you end up stuffing a damp towel into your locker every morning. I never travel anywhere without a few , but they're especially handy on an overlanding trip since you'll be responsible for securing your own locker on the truck. Wire-cable locks are preferable because they're less likely to snap as you bump over unpaved African roads. 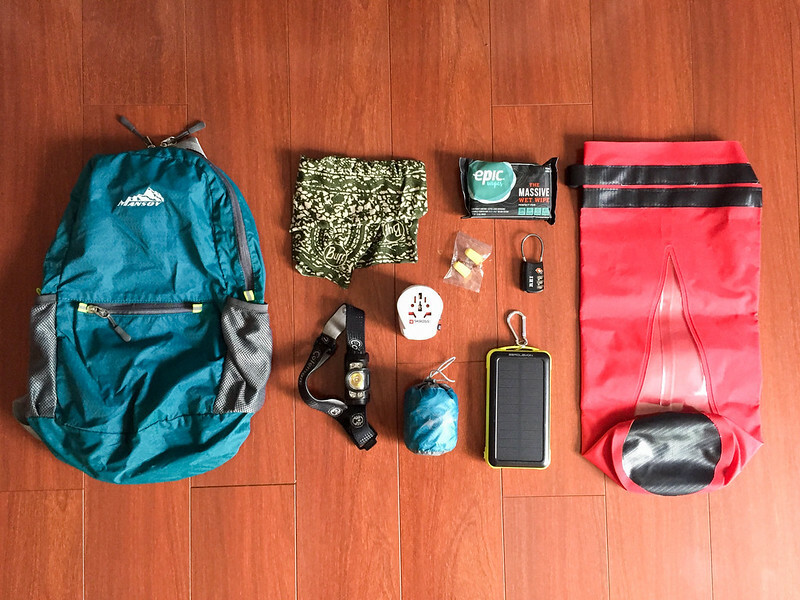 Many of my must-haves, including a packable day pack, a Buff, headlamp, travel adapter, inflatable pillow, Epic Wipes, earplugs, a wire combination lock, a power bank, and a dry bag. First of all, pack a toiletry bag with a hook so you can hang it up when you go to take a shower. You'll also want to bring some toilet paper of your own, some baby wipes for all the dust (or get some , which are essentially towel-sized baby wipes! ), moisturizer (it gets SO DRY), sunscreen, mosquito repellent, and a first aid kit containing things like band aids, pain killers, ginger chews (for upset tummies) and in case you get really sick (though I had absolutely ZERO stomach issues on my trip). *You'll also want to check whether your trip will have you traveling through any malaria zones. If so, be sure to see a doctor and get an anti-malarial prescribed. My last must-have is a beefy power block so you can keep your phone and other USB devices charged up. Many campsites will have a few power points (or at least one power point that your guide can hook a power strip up to), but you sometimes may have to compete with your fellow travelers for a spot to plug in your camera or iPad. I made sure to have lots of extra camera batteries with me, and used my 20,000 mAh ZeroLemon power bank to charge my phone (and sometimes my GoPro) in my tent every night. The ZeroLemon power bank I used is no longer available, but is really similar! My favorite travel sandals next to some ELEPHANTS! 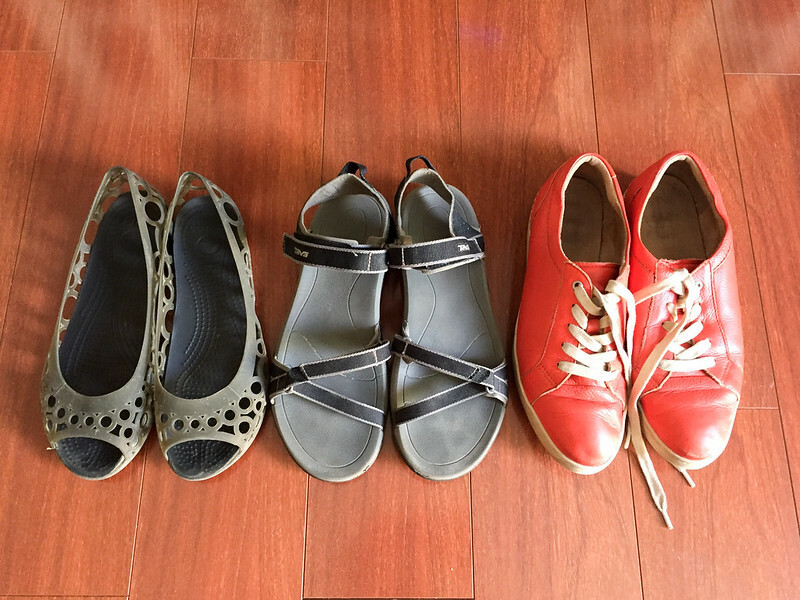 The shoes that explored Africa with me. *Note: If your overland itinerary will include things like trekking to see gorillas in Uganda or climbing Kilimanjaro in Tanzania, you'll also want to pack a good pair of hiking boots. My picks are . 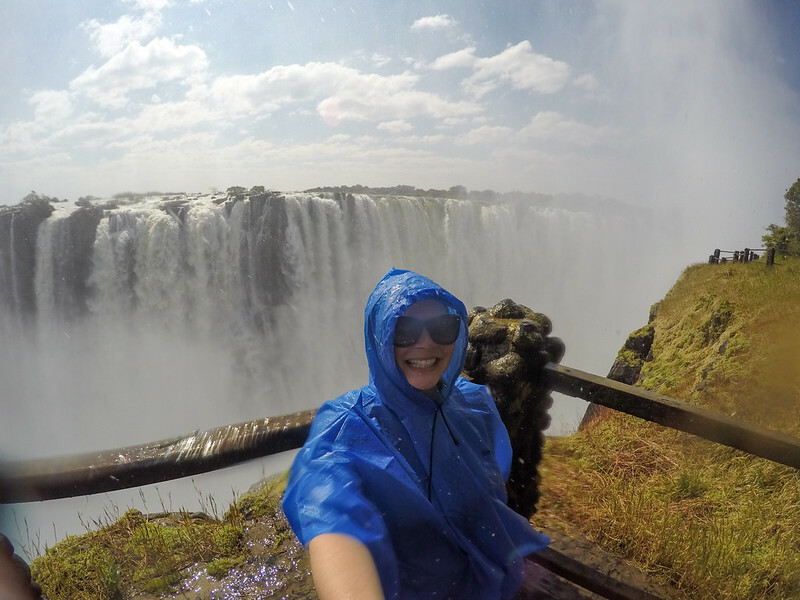 My $3 poncho was well worth it at Victoria Falls. A good outfit for climbing Dune 45 in Namibia. Another thing to “pack” for any overland trip is a good . Many overland/safari companies will require you to have insurance cover for your trip, because you just never know what can happen. Your personal health insurance might cover medical emergencies overseas (call to be sure), but you may still want to purchase an insurance plan to cover things like lost luggage, damaged gear, or trip cancellation. And if your regular insurance doesn't cover you outside of your home country? Then you definitely want to purchase comprehensive insurance that will cover medical costs (including emergency evacuation!). Have you ever been on an overland trip? Are there any other things you suggest packing? Bummer! They do make different kinds (for example, I have a silk liner that I sometimes take with me when I might be sleeping in questionable areas, but it doesn’t add any warmth at all). Mine definitely did give me some added warmth, but not quite enough for the low temps I encountered! Great list, Akatuki! The tip about layering is definitely a good one – theres nothing worse than being either too cold or too hot on a trip. Light layers is the way to go. Now I just need a safari trip to go on! I’m all about layering, no matter where I’m traveling! 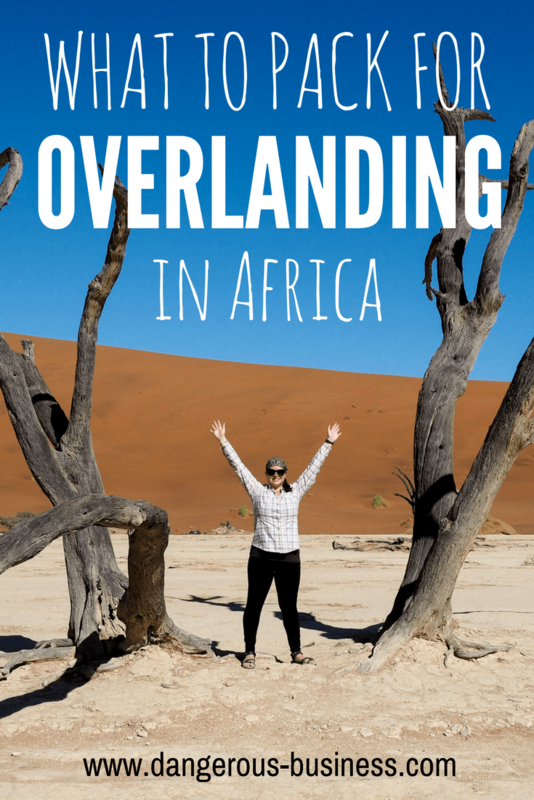 I can definitely recommend overlanding in Africa – I had such an amazing time and would love to do it again sometime. Wow, that is rather quite a list of things to Pack. Traveling overland in Africa is one of those things I really would love to do someday! I imagine that I would need a few months, I hadn’t thought of doing a shorter 3-week trip though! What was your favorite stop on the trip? I would recommend at least 3 weeks, though longer would be better! I spent 5 weeks total in Southern Africa, with 2 weeks in South Africa and 3 weeks overlanding, and I barely even scratched the surface! My favorite stop is impossible to say… probably a toss-up between the red sand dunes of Namibia and the Okavango Delta in Botswana. Or maybe Chobe! Or maybe Etosha! Haha, I can’t decide! A lot of people think Africa is brutally hot, and days can get warm. But African nights, even in the summer, can be really chilly. I was really glad we had a lightweight hat and a pair of thin gloves. Yes exactly! The temperatures vary much more widely than most people realize, especially in Southern Africa. This is a great blog post! I will be leaving for an overland trip that sounds very similar to your trip next month. How often did you find you had access to laundry? Did you hand wash clothing often? Thanks! It was 90% hand-washing at campsites. There was laundry service at a hostel we stayed at in Swakopmund (Namibia), but otherwise everyone just washed by hand. Our truck did have clotheslines and washing powder, along with a big plastic tub if there wasn’t a sink available. Great tips to prepare for going on safari! Hmm! Have I overlanded before? I’m not entirely sure! Does travelling through Eastern Europe by bus count? Awesome post. I’m going on a safari in South Africa in a month so this post came at the right time. Great! Happy I could help! Hey Akatuki! I definitely expected a good sleeping bag to be on your list :-). Awesome article by the way! 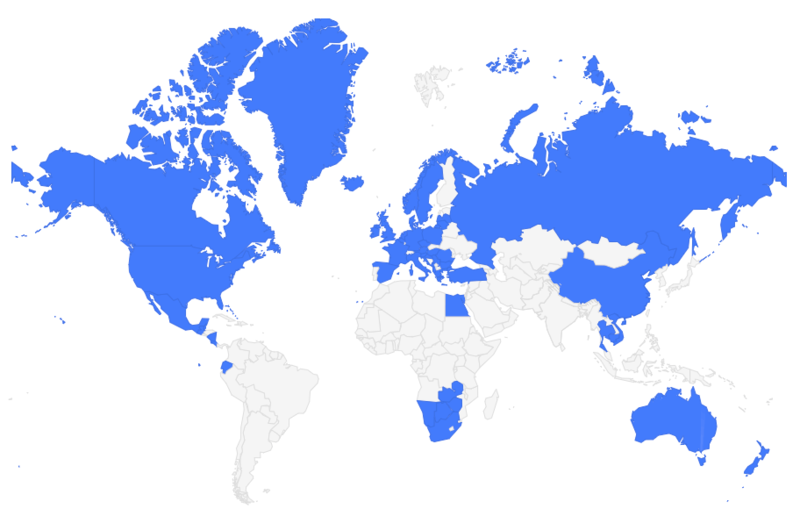 How many countries have you visited in Africa so far? Thanks! 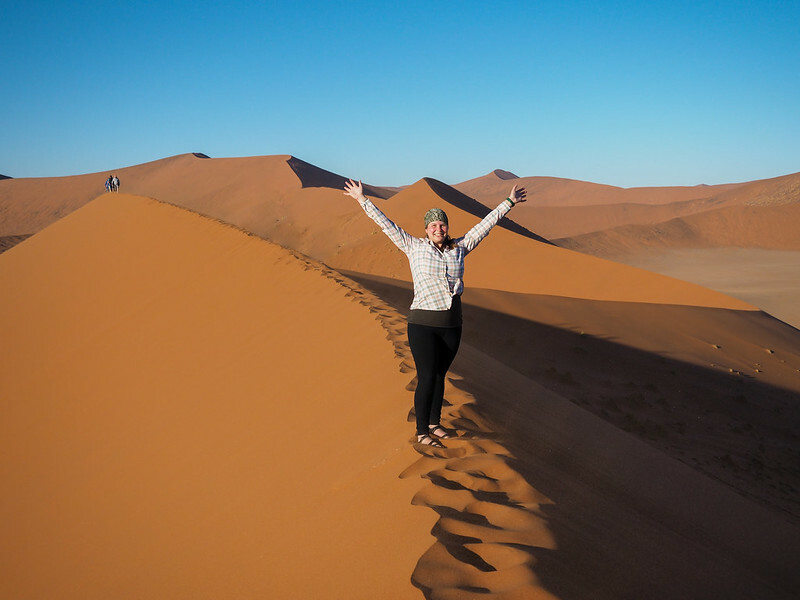 I haven’t visited nearly enough of Africa yet – only southern Africa (5 countries) so far! Hi, Great post, admittedly I only read it after we’ve just got back from our overland journey. We did the Leopard Hike at Blyde River Canon, which was amazing by the way – that’s another story. I had a pair of really cheap lightweight walking poles which were an absolute life saver, they cost $10 for two poles and I wouldn’t have been able to complete the trek without them! I didn’t get to visit the Blyde River Canyon, but that sounds awesome! Glad to hear the walking poles helped! I’m heading off on a Southern Africa overland trip at the start of February and I keep coming back and going over your details! With the clothing you listed, was that everything your brought for your trip, I think you said it was 5 weeks? Thanks! Yup, that was everything I packed! Everything in your bag will get dusty anyway – but everyone else in your group will be experiencing the same thing! I did a full “load” of laundry (i.e. handwashing in a sink) once on my trip, and washed underwear once or twice more. You may need to wash things more frequently if you’re going in the warmer months and getting sweaty, but you should be able to do this at most camp sites. I would bring some washing liquid or powder just in case your truck doesn’t have any on board! Wow, I didn’t know that there are overlanding trips through whole Africa. I explored for 7 months in Uganda, and I can tell it’s really a great country with nice and friendly people. Have ever visited East Africa? Yes, I know people who have overlanded all the way from Cape Town to Cairo! I haven’t been to East Africa yet, but I’m planning a trip for later this year!